1. Chop up the onion. I thought that because my onion was so big, that half of it would be too much so I originally chopped up a quarter of it. Novice mistake. I ended up adding the extra quarter to make the full half an onion. 2. Chop up/mince the garlic. I love me some garlic, so I ended up using cloves from half of the full head of it. 3. Boil the 2 cups of water and add the cup of quinoa. Reduce heat to low, cover and simmer for about 15 minutes. Once the water has completely evaporated, then it’s finished. Be careful not to burn the cooked quinoa. 4. Saute the onions. I cooked them in the olive oil. I sauteed them for about 2-3 minutes, though I didn’t time it – I just mainly used my expert observation skills picked up from eating Hibachi food way too many times. 5. Add the garlic in and saute for another minute or so. Add in salt and pepper or whatever other seasonings you enjoy. 6. Add in the baby spinach and saute for another minute. 7. 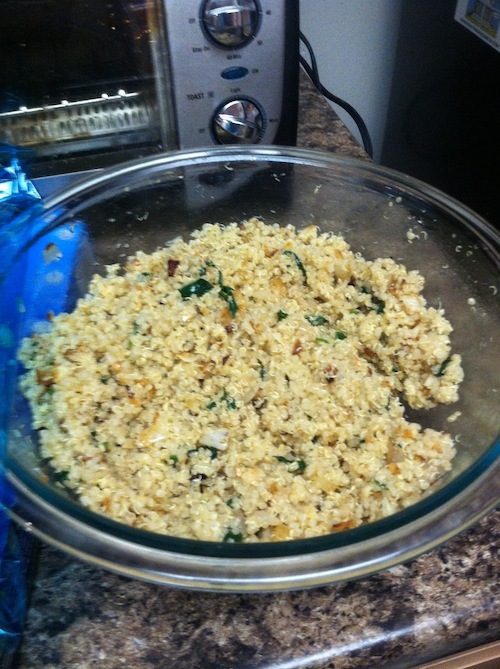 Mix the quinoa and onions/garlic/spinach combo together in a large bowl. Add as much or as little Parmesan cheese as you want. I also experimented by adding in a touch of olive oil here, though I don’t think it needed it and I wouldn’t do it again. Then cover and let it sit as all the flavors soak in together. I think that the Parmesan cheese is what really “made” this quinoa recipe so delicious. It tasted good without it, but once I added the cheese in, it really tasted complete. In the recipe that inspired me to try this, the quinoa and add-ins shimmer on low in chicken broth for 15 minutes before the spinach is added in, so you have that option if you want to further mask the taste of the quinoa itself. If you have any quinoa recipes or really any recipe, craft, etc. in general that you wanna share, let me know in the comments. I’m still on my big “make things” kick, haha. Enjoy this recipe! 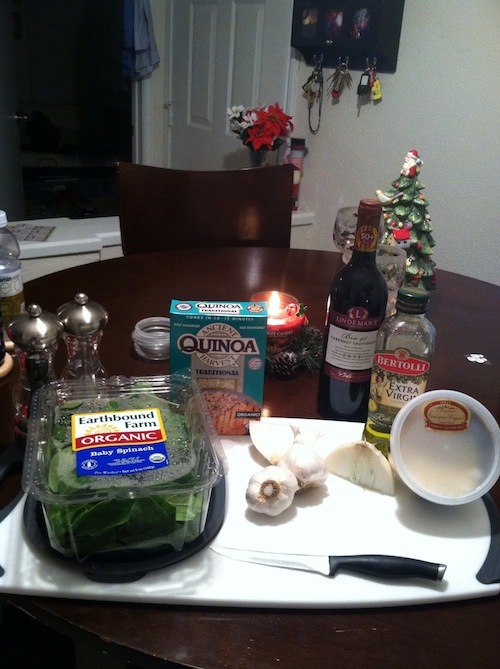 This entry was posted in Arts & Crafts, Food, Health and tagged Health food, Quinoa, Quinoa Recipes, Recipes. Bookmark the permalink.